The Bowmont Jumper from Finisterre / Fox Brothers and Co Ltd.
Today (23.11.12) sees the Bowmont Jumper from Finisterre go on sale at £150. Made from the wool of British Bowmont sheep (which is rather like Merino sheep wool) and (unusually for Finisterre who make most of their products in Portugal) it is made in the UK too in Scotland. Fab looking jumper. The Bowmont sheep are the last of this quite new breed left in the UK and are farmed in Devon. 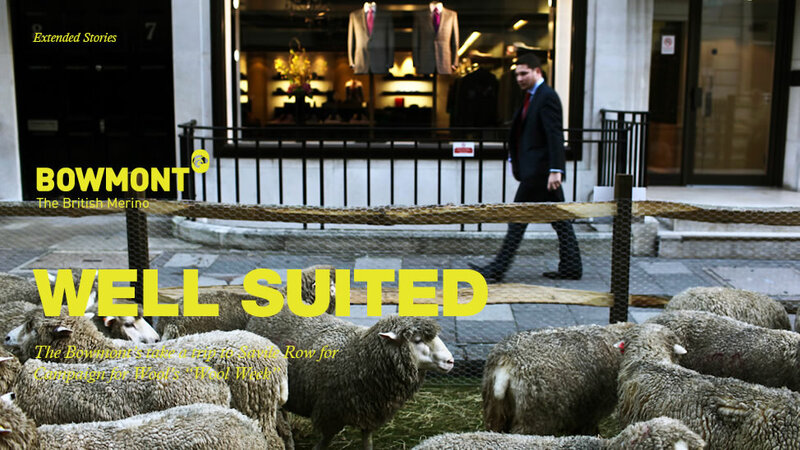 This picture is of Bowmont sheep in Savile Row, London in October 2010. This event was organised by the Savile Row Bespoke Association, Woolmark International, West Country woollen mill Fox Brothers and Dormeuil, in support of Wool Week 2010. The sheep starring on the day came from two farms in the West Country. One flock was from Harry Parker’s award-winning Exmoor Horn sheep farm in Wiltshire, and the other flock was from Lesley Prior’s Bowmont sheep farm in Devon. Did you know that the UK sheep flock is the largest in the EU with 15 million breeding sheep and 52,000 producers? Fox Brothers and Co Ltd are woollen and worsted cloth manufacturers in Somerset and were established in 1772 – http://www.foxflannel.com. They also own the website The Merchant Fox. This entry was posted in Clothing, Finisterre, Fox Brothers and Co Ltd, Jumpers, Wool and tagged Bowmont Sheep, British Wool, Finisterre, Fox Brothers and Co Ltd, Made in England, Made in Scotland, Savile Row, wool on November 23, 2012 by ukmade.